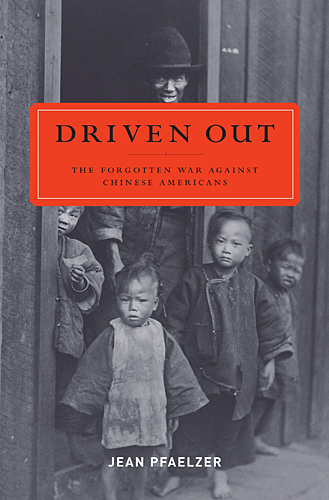 In DRIVEN OUT: The Forgotten War Against Chinese Americans (Random House Hardcover; On Sale May 29, 2007; ISBN 978-1-4000-6134-1), Jean Pfaelzer reveals the unspoken history of one of this country’s darkest episodes: a firestorm of ethnic cleansing that erupted in the forced expulsion of over 200 Chinese communities and thousands of Chinese forced from their homes in the 19th century American West. Pfaelzer examines how, filled with resentment over the collapse of the California gold rush and the economic depression that followed, communities from Wyoming to California and up through the Washington Territory, launched a series of violent attacks against Chinese immigrants: rioting in local Chinatowns, levying unfair taxes against Chinese workers, and forcing Chinese women who had fled to rural towns back into sexual slavery in San Francisco. By 1885, white citizens—mayors, judges, and vigilantes—throughout the Pacific Northwest rounded up thousands of Chinese immigrants at gunpoint, marched them out of town and burned their homes to the ground. In one incident, Chinese residents of a California town were given 24 hours to pack up and leave after a city councilman was killed in the crossfire of two dueling Chinese men. The entire local population of over 300 Chinese was stripped of their belongings, loaded onto steamboats in Humboldt Bay, and shipped to San Francisco. In Tacoma, with no notice, the entire Chinese community was marched nine miles in the rain and abandoned at a railroad crossing in the woods as Chinatown burned. But DRIVEN OUT is not just a story of injustice and victimization; here, Pfaelzer chronicles for the first time the valiant and tenacious Chinese resistance. Early Chinese Americans filed and won the first lawsuits for reparations in the United States. They demanded public education for their children, fought for the restoration of their property, organized strikes, refused to wear humiliating identity cards, and mobilized to reclaim their right to live and work in America. With over 70 photographs and often in the words of the Chinese themselves, DRIVEN OUT tells the story of an immigrant community that resisted racial prejudice by becoming politically engaged with their new home. Jean Pfaelzer is a professor of English, East Asian studies, and women’s studies at the University of Delaware. She is the author of four books and more than thirty articles in the areas of nineteenth-century American history, American studies, American literature, feminist theory, utopian fiction, and cultural theory. She was the executive director of the National Labor Law Center of the National Lawyers Guild, and worked as a senior legislative analyst to Hon. Frank McCloskey on immigration, labor, and women’s legislation. She was appointed to the Washington, D.C., Commission for Women and was a consultant for the Coal Employment Project, the organization of women coal miners.